Trystars will again run at Applecross for FTC with an exciting new format and more fun than ever. Please join us at Jeff Joseph Reserve in Applecross, utilising the river for our swim and safe paths for ride and run. The program is suitable for children aged 7 to 14 years who would like to get involved in this amazing sport. All they need is a bike, helmet, bathers, goggles, towel, hat and sneakers. This programs focuses on the basic elements of swim, bike, run and transition in a fun, non competitive environment. The only requirement is that you can swim unassisted for 75m. The swim component will be in the swan river and close to Applecross jetty and to shore. 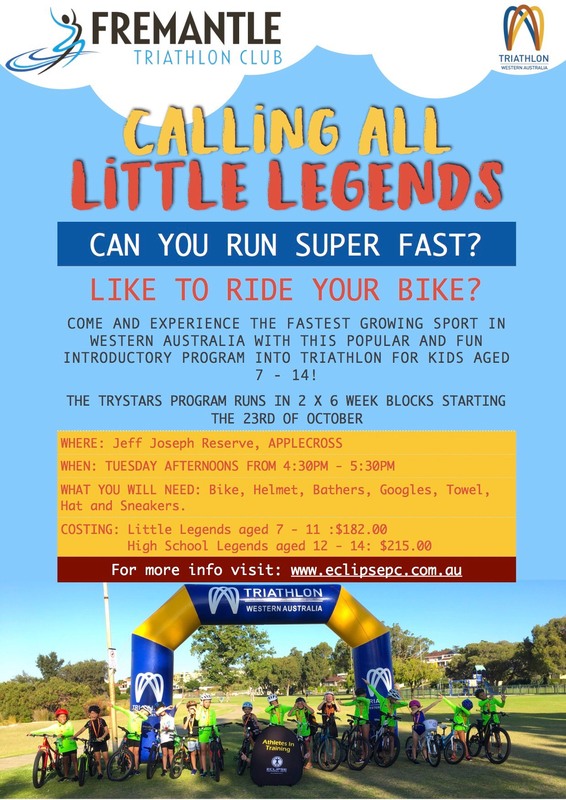 Once you have a registered with Triathlon Australia and Fremantle Triathlon Club, please register for the actual program at www.eclipsepc.com.au – you will need to quote your membership number. Registrations will open on 1st October, and close on 18th October.